Home > Health & Fertility > Pregnancy Test Technology: What's New? When a woman thinks she might be pregnant, she wants to know as early as possible. This has been true since prehistory. In the time of ancient Egypt, written documents tell us that women used to urinate on barley seeds and then check to see if they grew – if they did, she was pregnant. When researchers have tried this, they have observed it works about 70% of the time, so this was quite a successful ancient pregnancy test. It then took a long time for scientists in the modern world to work out what hormones were, what hormones were produced in pregnancy and ways to detect when they increased in concentration in early pregnancy. Progesterone was not isolated until 1934 and the presence of the human chorionic gonadotrophin (hCG; the hormone used in the pregnancy tests we have today) was only recognised for the first time in the 1920s. Some of the early scientific tests to show a woman was pregnant before there were any obvious physical signs involved injecting her urine into animals – rats, toads, rabbits and frogs – and then seeing if the animals started ovulating. This was not very accurate and involved the death of several animals for each test, which was obviously unacceptable. It was not until the 1960s that an in vitro test for pregnancy was developed. This was a type of haemagglutination test, which means that it involved adding the woman's urine to red blood cells to see if they clumped together. Purified hCG was used and mixed with a urine sample and antibodies against hCG were added. If there was a positive reaction, clumps of red cells indicated pregnancy. The trouble was that even this test was very insensitive and was also prone to false positive results. It was hardly more accurate than the grain and urine test of the ancient Egyptians. This was developed in 1970 and involved a lab test, lab equipment and a trained scientist to carry it out. It was based on hCG and could confirm a pregnancy as early as four days after a missed period. A complicated but early home pregnancy test was developed and sold to women only in the late 1970s. It took until the 1980s for the more modern pregnancy kits to become available. This brief history illustrates how far we have now come. Since 2003, digital pregnancy tests have been available that need to be dipped in a urine sample for just a few moments to reveal a result. 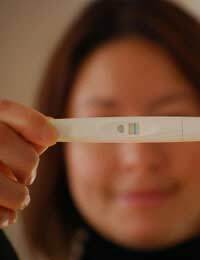 The appearance of a line indicates pregnancy, the absence of a line means you are not pregnant. These are produced by various manufacturers but all work in the same way. They detect minute quantities of hCG in the urine. This hormone is produced by the body as soon as the fertilized egg implants in the uterus. After 24 hours, the amount of hCG in the blood doubles and today's pregnancy tests are sensitive enough to detect this. In 2003, the first 'clear blue line' tests had a limit of sensitivity of 100 units of hCG per ml of urine. Today, pregnancy tests can detect concentrations as low as 20 units of hCG per ml of urine – so are 5 times more sensitive. Testing urine at this level of sensitivity gives a positive pregnancy test result the day or so after implantation of the fertilised egg – which is about a week before a woman would notice a missed period and 7-10 days after ovulation. Greater sensitivity and accuracy is possible with early morning urine samples and some medicines can still affect the result, so it is not completely 100% accurate. The advance in pregnancy test technology has been very fast in the last few years. Pregnancy tests can now tell a woman she is pregnant before she misses a period. The problem is that many early pregnancies falter at this early stage – which can cause distress in a woman who is longing for a baby and uses the test very early. A positive result may mean implantation, but it may not mean pregnancy and, when her period arrives a week or even 10 days later, she can experience this as a miscarriage. Without such an accurate early test, she would never have known that she had any possibility of being pregnant.